Is it becoming a challenge to find a place to change your baby, especially when you’re away from home? Do those dodgy changing stations in public restrooms make you want to coat your baby’s whole body in hand sanitizer? Babies aren’t known for their good timing or their ability to wait patiently till you’re home before unleashing a diaper-explosion on you. When the time comes for a change, you’ll want a good place to lay your baby down and get rid of any incriminating evidence. You’ll need a changing pad, right? If you’re looking to buy one but feel confused about what you should be looking for, consider the following ins and outs when choosing the perfect changing pad for you, whether it be for at home or on-the-go use. Use the links above to check the latest prices or read our in-depth changing pad reviews below. Is a Changing Pad Necessary? How Many Changing Pads Do I Need? When you become a mom, your baby is going to need thousands of diaper changes just in his first year (source). And some of the places you’ll be forced to change your baby are going to leave you seriously grossed out. In addition to the wall-mounted changing tables at shopping centers that look like they haven’t been cleaned in twenty years, you’re also going to find scandalously dirty changing stations at restaurants and gas stations. I once saw a shopping mall changing table that was so gross; I walked 10 minutes to go outside to my vehicle so that I could change my baby in my car because I’d forgotten to pack a changing pad in the diaper bag. I was keeping my fingers crossed that she wouldn’t pee all over the seats in my car when I was changing her, but I had no choice. I’m not a picky person, but I draw the line at using a changing table that obviously wasn’t cleaned after another baby had a poop blowout on it. Since you can’t control where your baby does their business, you’re going to have to be prepared to do a diaper change no matter where you are. That’s where a changing pad comes in handy. I wouldn’t be without one. Don’t Some Businesses Offer Disposable Changing Pads? Some of the places I mentioned above will have disposable changing pads for you to use, but they honestly don’t provide enough protection. These pads are flimsy, not nearly long or thick enough, and you should never depend on them because most businesses don’t offer any. You might catch a lucky break if you’re caught without a changing pad and there’s a disposable one on offer, but don’t count on it. Just bring your own and be sure. Sometimes, having a changing pad is less about protecting your baby from filthy changing stations and more about saving other items from the contents of your baby’s soiled diapers. Sadly, poop blowouts are a fairly common occurrence in your baby’s first year. Once an item is that soiled, there’s no coming back. It’ll leave a huge stain and smell bad, especially if the item isn’t machine washable. You might be much happier to sacrifice a changing pad cover than something more expensive next to or underneath it! Here’s what you need to consider to avoid getting a changing pad that isn’t right for you. Portability: Diaper bag pads need to fold easily. You don’t want to lug around what feels like a giant yoga mat everywhere you go. Fit: You probably already have a changing table picked out, or you might have a crib with one built in, so you need to make sure the pad you’re looking at will fit. Straps: Some changing tables have straps, some don’t. They’re there to secure the changing pad (source) and stop it from sliding around while in use. Non-skid bottoms: Babies wiggle around a lot when you’re changing them, which could be dangerous if they’re high up on a table. Consider a non-skid base, especially if your changing pad doesn’t have straps. Belts: Some moms like the idea of having safety belts. This can come in handy if your baby likes to kick around a lot, and gives you peace of mind that your baby won’t take a tumble when you turn your head for a second. Waterproof material: Sometimes babies give you an extra surprise and pee on everything before you’ve had a chance to load a new diaper. Would you rather have a waterproof material that will keep your changing pad like new, or would you rather have a washable cover that soaks up the pee? Using changing tables for changing your diapers is a convenient and popular way to go. 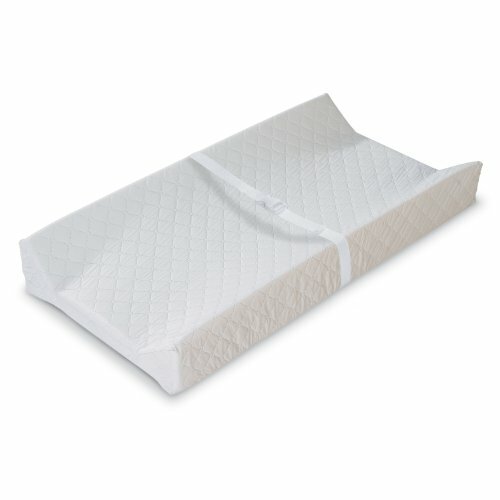 When you shop for pads to fit a changing table, you’ll want a thick, contoured pad with a strap that will discourage your baby from rolling side to side or accidentally falling off the table. 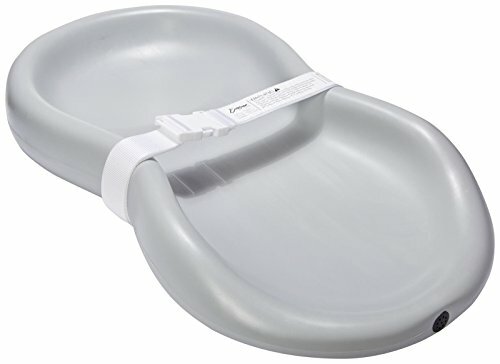 This pad is a great choice for moms who’re worried about the safety of their baby on a changing table. It comes with a very wide, soft strap that keeps your baby in place and safe while they’re getting some TLC from you. Plus, the plush strap won’t leave your baby with red marks on his abdomen. The strap is adjustable to fit a variety of ages, from newborns to toddlers, and the foam the pad is made from is contoured on the rims, making it hard for even dedicated escape artists to wriggle away. This mat is a good overall size at 16 x 32 x 3.5 inches, so you don’t have to worry about it being outgrown too soon. The cover uses waterproof materials. You can remove the strap when you need to clean it and throw it in the washing machine. The materials used for the pad are non-toxic. The foam pad is recyclable when your baby outgrows diaper changes. Some babies may find the loud Velcro belt disturbing, especially if they’re sleepy. Older babies will be smart enough to pull off the Velcro strap, which is easier to open than traditional click straps. For infants, you'll want to find something that has soft fabric that won’t irritate any sensitive skins. You’ll want something that won’t feel cold on their backs because infants spend a lot of time sleeping. You also don’t want them to wake up when they’re getting sleepy just because of a frigid changing pad. 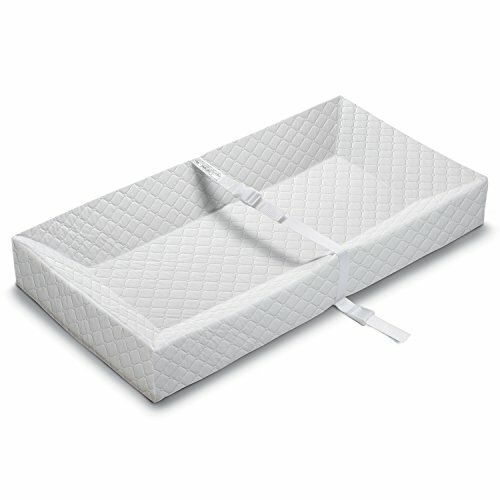 This model is 16 x 32 inches and will fit most changing tables, plus it has security straps to firmly attach it to furniture. 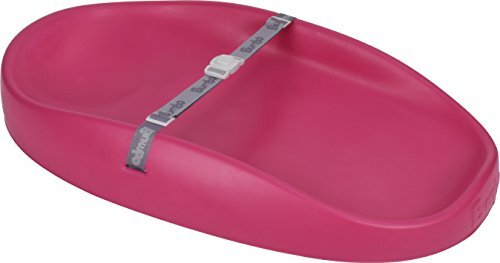 The non-slip bottom means your baby won’t go skidding as you try to wrangle a particularly disastrous diaper off them. You can buy a batch of matching covers in different colors or patterns to ensure your baby is soft, warm and clean with every diaper change. The pad itself is made of waterproof material that you can easily clean up in case of accidents. Both the click belt and the contoured walls stop your baby from rolling from side to side or falling off completely. Universal covers fit on this. There’s a bit of a plastic smell to this pad. Despite the fact it has a non-skid bottom, some complain it still slips. When you buy a pad to use on top of your dresser, it’s crucial that you get one with a strap to anchor it down to make sure it doesn’t go slip sliding away. While comfort, size and cost are important too, this particular safety feature is one thing you really shouldn’t overlook. This LA Baby includes a security strap that you can fasten if you want to use it on a dresser top. 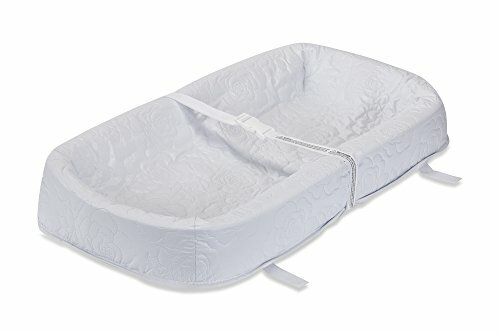 For added safety, it also has a non-skid bottom that’ll keep the pad nice and stable during diaper changes, plus the sides are 4 inches high to prevent rollovers. The outside of the pad is waterproof, phthalate free, non-toxic, anti-microbial and you can easily wipe it clean with a washcloth. There’s an additional buckle for strapping down all those babies that like to squirm all over the place during diaper changes. Plus it’s made in the U.S., if supporting American-made products is something you’re keen on. Good for smaller spaces, like dressers. Standard covers fit just fine on this. Comes with security straps to mount to a dresser. The straps can’t be removed if you need to wash them. The plastic has a crunchy feel to it. We're all guilty of buying baby stuff that we later regretted since it never got used in the end. But if you're a parent who's dedicated to cutting down on unnecessary baby gear and going a more minimalist route, you'll appreciate those super-useful items that combine functions while saving you space and money. This portable pad will carry everything you need to pull off a successful diaper change, all in one mini carry pouch, with a cute red wipes case included. To give your baby extra comfort, the head section has been padded with a pillow. A mesh pocket on the pad can hold four large-sized diapers, with room to spare for creams and anything else you might need on-the-go. The front zippered pocket can also hold your cell phone, chapstick and anything else you might need to grab frequently on little trips out the house. This pad also has a strap with a clip that can be conveniently attached to a stroller or carried by hand. It’s sturdy and will hold up well. 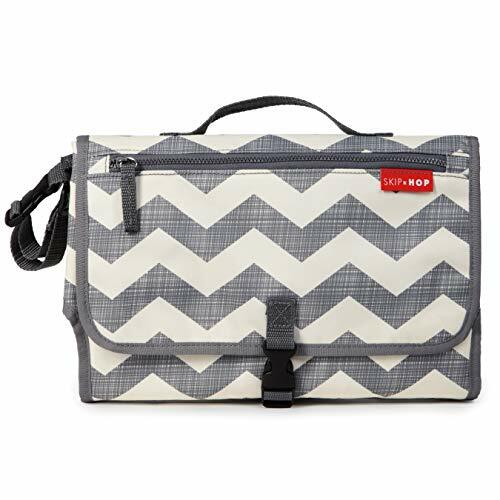 It fits into even smaller-sized diaper bags. The red wet wipes container transfers some of its color onto the wet wipes. It’s waterproof on both sides, which makes it slippery on hard surfaces. When I first set up my baby's changing station, I was a little annoyed at all the separate pieces it would take: a table or at least a conversion kit, a changing pad, multiple covers, possibly a tiny pillow... In the end, I wished I had gone for a simpler design to save myself the extra laundry (and expense!). If this sounds like you, consider a one-piece plastic pad without all the extra frills. This cute “peanut” pad is more like a helpful little cushion that you can endlessly wipe down no matter what gross things your baby does while they’re on it. The design is simple and one-size, incorporating high sides, a safety belt and a squishy surface all in one smooth shape. While a little pricey, you only need to buy this single piece and nothing more. There are a few fun colors available, and the base grips any surface, preventing it from sliding around. The material is comfortable, puncture resistant and discourages bacterial growth, so you can be sure it’s clean and safe even after extended use. Excellent for really messy diaper changes! No extra laundry to do. No need to buy a pillow, covers or any extra pieces. Some parents disliked the oily feel of the plastic. The chemical odor can be a little strong. Not everybody lives in a mansion. When you’re cramped in your house, you need a pad that won’t take up a lot of room. Babies already need so much space for all their gear, you don’t need a big, bulky changing pad on top of everything else. If you’re so short on space that you’ve opted out of having a changing table entirely, this pad may be your perfect solution. With the four sides, you don’t need a table, as this will fully cover whatever surface you put it on. When you’re done with it, you can simply stash it in a closet until you need it next time. It has contoured walls and a safety strap, which will keep your baby safe even if you use it on an elevated surface. The cushioning is double layered, making this a durable option that you’ll get a lot of mileage out of. It can be anchored to a dresser if you want. Reasonably priced compared to other brands. The four sides make it harder for a squirming baby to do much moving around. It’s nice and thick, making it comfortable on hard surfaces. It’s difficult to clean because there are decorative perforations are hard to reach with a normal washcloth. Because of the deep four sides, it’s hard to find a cover that will fit. The first time your baby decides to surprise you with a diaper blowout, you may be so disgusted you want to hose them down, set fire to the nursery and run far, far away, never to return. If you're a parent who's nervous about having your little mess-machine destroy the hard-to-clean fabric of a traditional pad, consider a more hygienic rubber or plastic one that can be thoroughly wiped down if necessary. This one piece design by Bumbo is a perfectly shaped polyurethane pod to put your little stinker on, without worry that they’ll stain any cute pad covers you’ve bought. This is a simple, modern looking piece of gear that can be far more thoroughly cleaned than perhaps a foam or fabric pad could be. It’s soft, comfy and comes with a clippable restraint belt to keep baby secure. The material is really quite similar to the classic Bumbo seats you may be familiar with — and just as easy to wipe down. The slight slope means any errant pee will flow down and away from baby. No need to change and launder pad covers; just wipe clean. Ergonomic design is comfortable for your little one. This is on the more expensive side. Some parents have complained of peeling after a few months of use. If you've given a lot of thought to sourcing the most environmentally friendly and hypoallergenic bedding and clothing for your baby, why not have a changing pad that follows the same principles? Especially for sensitive skins or babies who have allergy trouble, a natural, chemical-free option is the best way forward. This Naturepedic pad is constructed without any hazardous chemicals or materials such as latex, PVC, formaldehyde or phthalates. The fill and fabric are both organic cotton which is unbleached and undyed, plus the supportive sides are food-grade polyethylene that will not aggravate any allergies. The shape of this pad is great at containing your little one while you change them, and the surface is soft and cushiony for a warm, comfortable feel. For safety, sturdy snap screws attach the pad to the dresser, and a top buckle keeps baby where they should be. The pad feels really luxurious to the touch. The Air Core support layer makes this pad a bit like a tiny mattress. Seam quality and stitching is sometimes lacking. 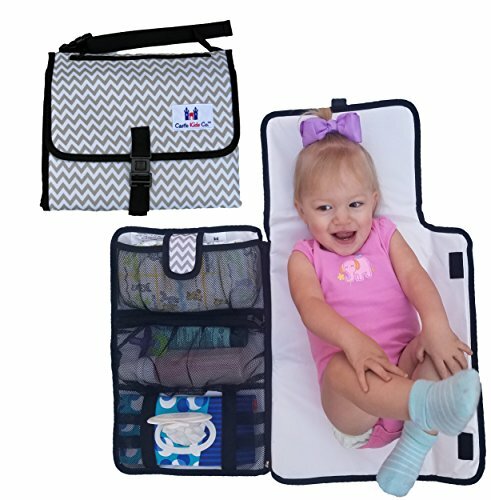 This Summer Infant Quickchange is big enough that your baby will be fully protected, but small enough that it can fold up neatly into your diaper bag. 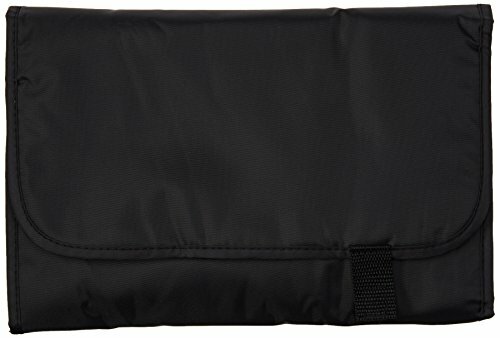 Once you have it folded, it closes firmly with a Velcro tab, meaning it won pop open later. Although it’s thinner than products you’ll use at home, it’s thick enough to give your baby some comfort when being changed on hard surfaces. The material is easy-to-wipe plastic which is a cinch to clean up. It won’t be big enough for a toddler. It’s pretty slippery so you’ll have to be careful if you change your baby on high surfaces. The surface won’t feel warm on your baby’s back. When you’re traveling, you need a pad you can use anywhere. It can’t take up much room, and you don’t want to pay too much for it since you likely won’t be using it very often. You’ll also want it to pull double duty by having another function so you won’t waste the space. This nifty product doubles as a storage bag. With three pockets and one compartment, you can stash all the little things your baby might need like a bottle, wipes, extra clothes, ointments and spare diapers. This is large enough even for toddlers, and waterproof so you can easily wipe off any accidents. It’s so compact when folded; you’ll barely notice it’s there at all; just grab the handle and you can bring it along on your travels, or use the two buckle straps that let you fasten it to your stroller. It will hold everything you need for diaper changes. Easy to clean and won’t stain. Folds up to a compact size. Easy to carry because of the handle. Doesn’t hold up well with heavy washes. The outside material is rather rough. You’ll likely want two, a portable one to use when you’re out of the house and one to use at home on your changing table. I bought two with my first baby. One went in my diaper bag and the other was permanently at home on my changing table. I loved the soft feel of my at-home pad and the fact that it had straps to firmly attach it to the table. But it certainly wouldn’t fold up well. On the other hand, the pad in my diaper bag wasn’t as thick and fluffy, but it was way more portable. It folded to take up virtually no room at all. First, install the pad correctly according to the instructions. Anchor the pad to the surface securely using snaps, straps or nails and test it thoroughly to make sure it isn’t going anywhere. Pre-wash any covers, if you’re using them, and attach. Make sure any top strap or safety belt works and adjust it to the correct length. If your pad isn’t non-slip, consider placing your own non-slip mat underneath. Do a safety check: when getting changed, can your baby pull anything down onto themselves, or get hurt on any sharp edges? The first time you use the pad, lay your baby down and strap them in, then change the diaper. Only undo the strap when they’re done, buttoned up and ready to be taken off the mat again. Make a note of where you’d prefer to have all your accessories and change your layout accordingly to make the whole process as quick and easy as possible. Remember, never leave your baby unattended on a changing pad, even if they’re strapped in. How you wash your changing mat will depend on the kind you have and the material it’s made from. Most manufacturers will clearly outline any laundering instructions you need to follow, though. For plastic, contoured pads: Simply wipe down with water, a little detergent or even a weak solution of bleach after each change. Consider keeping a small spritz bottle in a diaper caddy to whip out when you’re finished. For foam pads: Cotton or polyester pad covers can be washed as usual in your washing machine, but avoid doing the same with the mat itself, as you’ll likely destroy it. Instead, wipe down and make sure to air dry to prevent any staining. You could also try vacuuming the pad. Pads with softer fills: These can sometimes be machine or hand washed, and you might like to use a splash of white vinegar, bleach or a stain remover powder to get rid of any soiling. For portable pads: Wipe down with a wet cloth and a little bleach and air dry in the sun; avoid putting in the washing machine, especially if most of the material is synthetic. My favorite is the PooPoose pad. Aside from its adorable name, the safety belt on this pad is my favorite. It won’t irritate your baby’s skin because it’s so thick and plush, and your baby will love how snuggly the top surface feels, even if they can’t tell you! It’s pretty expensive for a changing pad, but it holds up well and is big enough that you’ll be able to use it even for toddlers. Plus, if you’re worried about safety, this is an excellent choice with its contoured sides and non-toxic materials. Do you have any questions, comments or helpful advice for new moms setting up a diaper changing station? Share below; we’d love to hear your thoughts! What a wonderful surprise! Thank you for the nice article and shout-out. 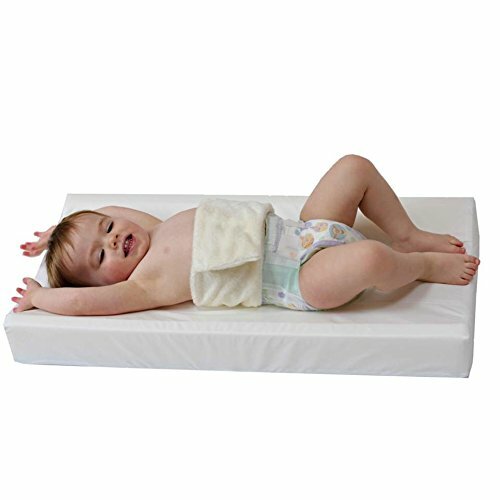 We created our changing pad to help diaper our own daughters, and we are happy to be your top pick! Thanks for leaving such an awesome comment! You are more than welcome for the shoutout, I’m all about recommending the best products to my readers, and yours certainly is one of the best. I also think that the story behind PooPoose is a true inspiration and a great example of innovation through necessity.